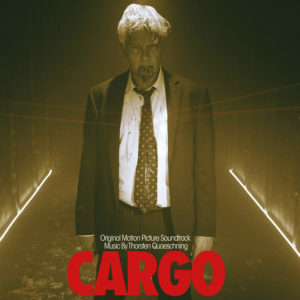 Cargo (2018) – not to be confused with the 2017 Netflix movie starring Martin Freeman – is a taut one-man thriller written and directed by newcomer James Dylan, starring veteran actor Ron Thompson in the lead role. Cargo tells the bleak, yet compelling story of the events that unfold when a man wakes up trapped inside a cargo container with only a cell phone. He is given 24 hours by his kidnappers to raise 10 million dollars in ransom or die. German musician and composer Thorsten Quaeschning joined legendary electronic group Tangerine Dream in 2005. After founding member Edgar Froese’s death in 2015, Quaeschning is now the leader of the band with fellow bandmates Ulrich Schnauss and Hoshiko Yamane. Quaeschning also has the side project Picture Palace Music, and it is under this moniker that he scored Cargo. The soundtrack album for Cargo runs a generous 66 minutes, which is impressive since the film only runs for 80. I haven’t seen the film, but I doubt all 66 minutes are featured in it. I presume the composer has chosen to expand on his ideas for the soundtrack release. The highlight of the album is the 16-minute track «Wanderbaustelle», which is a glorious, sequencer-driven piece reminiscent of both Rich Vreeland’s It Follows and the music of Jean Michel Jarre. Quaeschning really fires on all cylinders here, and I would be interested in finding out how this track works in the film. The score is not all-electronic, though. In four of the tracks, a string trio is featured, giving the score a sense of “Hollywood”, especially in «Cargo Main Theme», which for some reason appears as track 12 (of 16). The composer himself is a multi-instrumentalist, playing piano, glockenspiel, drums and electric guitars in addition to the synths and electronics. This “band feel” is on display in the rock-infused, wall-of-sound-like track «Spotlight Effect» and in «Aggravated Circumstances» with its distorted guitars. These tracks are closer to the post-rock genre and highlights Picture Palace Music more as progressive rock than electronic music. Other tracks are more 70s/80s electronica, like «Chain Initiation», «Isolation Fault» and «Trade Mark Activation», while the beautiful «Tom’s Theme» reminded me slightly of the music from Stranger Things. Cargo is a varied and exciting score which will ubdoubtedly feature on this reviewer’s list of the most interesting scores of 2018. Hopefully the film (with a tentative US release date of August 14, 2018) will provide Thorsten Quaeschning more opportunities in the film music world. He has now joined the long list of (former) Tangerine Dream members who have dipped their feet into American cinema. I have the album, and I agree with you. Thank you for a well written and competent review.